Our unique swivels make the least possible noise we could come up with and still function as well as the original stainless steel swivels. Noise was the reason we had these made. They should last about three years per set. Included are two sets of composite grey or black swivels and one set of stainless steel hardware. From Mike Smith of Claremore, Oklahoma on 8/4/2018 . I am having to buy another flag because another set of these swivels broke. Half the time, I lose my flag, too. 8/19/2018 – You responded to my review by saying the plastic swivels make the least possible noise. But on a Harley it doesn't make much . . . Response From Patriot Guard Riders: We will not be offering the stainless steel replacement pieces in the store as they are only good on the stainless steel poles, not the aluminum poles. And the cost would be too cost prohibitive to be sold in our store. You can contact the manufacturer directly to purchase the stainless steel parts. 7/11/2018 – What diameter flag pole are these swivels designed to work on? 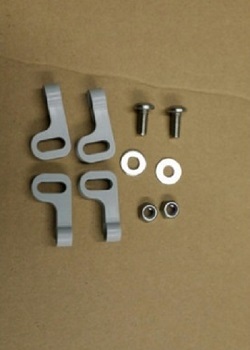 Response From Patriot Guard Riders: The swivel replacement set is manufacturered specifically for the swivel flag pole sets sold in the store. 6/18/2018 – Just what is a Swivel used for? Response From Patriot Guard Riders: The swivels are part of the swivel flag pole mounts used for motorcycles.